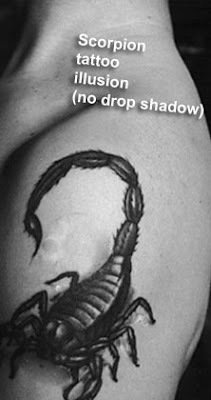 How to add illusion to your tattoo a comparison of drop shadows. If you’re thinking about getting a tattoo, here’s something you should know. Scary animals with subtle drop-shadows look much better than those without. Above, you will see the original image, that this man has had tattooed. Very cool, especially how the tail of the scary arachnid looks like it’s in the air and about to strike. Next, look at the image below and you’ll see how I edited the image so there was no drop shadow. Now it just looks like a puny drawing on his arm. So the moral of this story is this: If you get an animal as a tat, and you want it to look a little intimidating, then you need to use a drop shadow like this guy!